On Wednesday, at the annual meeting of the Tridentine Mass Society of Madison, I was elected to the organization’s board, together with youthful local blogger Ben Yanke, who just secured an internship with New Liturgical Movement blog, and Father John Zuhlsdorf, who is TMSM president, having been nominated for such by Bishop Morlino. Ben pointed out it’s “the blogger board.” It’s also definitely the Pope Benedict XVI “hermeneutic of continuity” board. There is a rightness to the old Mass, “the extraordinary form,” that refreshes and renews the soul; we step out of the vernacular and mundane to encounter God; it can be like a retreat. I love Novus Ordo Mass, “the ordinary form,” in Latin too. With the old Mass you have the Gregorian chant intact in the traditional calendar, and this also I fell in love with, through my experience with the Schola Cantorum, the Gregorian chant choir. Vatican II calls that musical heritage a “treasure of inestimable value.” I love the prayers at the foot of the altar. I don’t know about you, but I do need to be sprinkled with holy water, and I do need the triple non sum dignus. I just turned 35. Did I even know, while I was growing up Catholic, that we believe that Jesus is truly bodily present in the Eucharist, and the Mass is truly the re-presentation of His one saving sacrifice at Calvary? Probably not, which was a result of changes in the Mass and the altered understanding many people had about the Mass. In actuality what the Mass is, didn’t change a bit. But there was just a great loss in understanding, in belief, in reverence, and as a result, people could no longer see why they needed to come to Mass, much less why they needed to go to Confession. Today the old Mass is helping restore continuity in the Church, dignity, reverence and timeless beauty in worship, helping us to remember what the Mass actually is, a sacrifice, and recover our sense of awe and mystery, and that it is centered on God and not on the priest or the congregation, and that in the the Mass the priest addresses primarily God, rather than the congregation. I suppose if you think of Holy Mass as religious entertainment rather than worship, and as something that we decided on the form of rather than something given to us, handed on to us, and you have amnesia about the reasons Pope John XXIII gave immediately before Vatican II about why it matters to use Latin, it might seem like the old Mass is a most pretentious form of religious entertainment. There is no TV show, no broadway performance or movie that is narrated in Latin (okay, The Passion of the Christ–a film I have not seen and do not care to see, but which is, of course, a traditionalist-Catholic-made film showing graphically the one sacrifice of Christ that is precisely the sacrifice of Christ on the altar at Mass). It seems to me that that’s the point, really: the freedom of the Holy Mass from mundane and secular associations that go along with the vernacular, secular musical forms, etc. It is different from any form of entertainment. As we enter into praying the Mass, this helps our freedom to center on God and to worship. This is true even if we don’t know Latin, though a translation is valuable, it is good to have our hand missal. 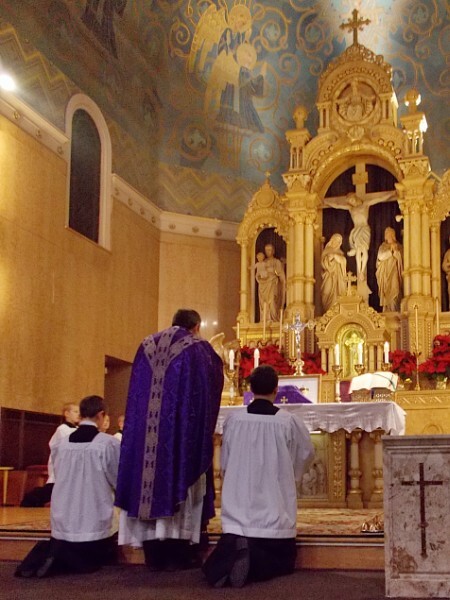 If we’re properly catechized, we know what the Mass is, entering into it with profound humility and contrition, and offering our whole self, all that we have, our sufferings and joys, at the offertory, and are praying profoundly, with our whole self, our whole life, what the Mass is. A comment from a reader in another state: I think that German cardinal is wrong but I also think there IS an element of elitism among some of the TLM folks. There is an element of elitism in any group that thinks it is right about something. I think you and the ‘blogging board” have a tremendous opportunity here and I just want to remind you to watch out for that element. It can be tricky to let a group like that know that you are working for them, but not only for them, and that you are speaking for them, but not only for them — but when you accomplish it, that is the best way to make things better for EVERYONE. When you are able to open an elitist group (and often, groups become that way because of real difficulties and hardships they have encountered) back up, and you are able to awaken the general group to what it has to offer… well, that’s a really great thing. Not always possible, but really great. One of the easiest things is to foster the friendly people and get them talking, and to get the ones who are not friendly (or who are judgmental and/or unpleasant) something important to do that does NOT have them talking to people. Easy — but it’s amazing how many people don’t think of it. Good luck!!!! I really don’t know yet what this role will entail, but offering what we have that is good to more people is something I hope for. At my parish, our TLM is at 7am, which limits the number of people who can come, and it is so soon before the next Mass, that it is not very convenient to have a breakfast afterward, though we have occasionally. There is not a real robust social community or social opportunity connected with this Mass. Fr Z has some good ideas, that will require more discussion. Securing the future of our Schola is also on the agenda. Thank you, Elizabeth! Thank you to all mentioned in this article. Went to Latin Mass Preborn in 1950-1951, and then baptized and attended Latin Mass up through changes during grade school. Love the Mass and love Latin. Blessed to be in choir at St. Mary in Pine Bluff. Married and husband will keep us at St. Mary. Very nice article and my feeling exactly. I love what you are helping take place there in Wisconsin, my home state. I now live in Colorado but when I come back to visit every year, I always must visit the TLM celebrated in Platteville, which is in your diocese. God bless your efforts.